Hey, moms and dads, if you want to know what’s going on inside your baby’s head, try learning sign language. 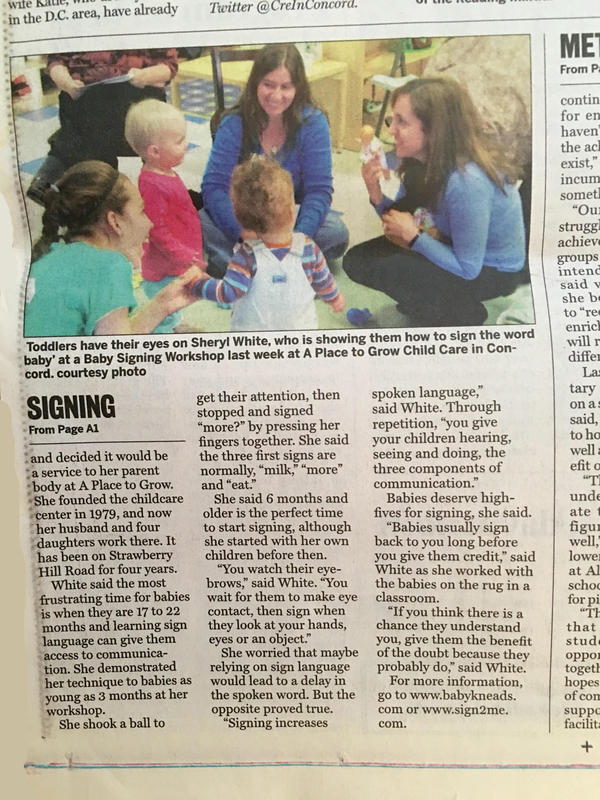 That’s the message from Sheryl White, owner of Baby Kneads, who teaches parents of babies and toddlers how to sign to begin communicating with their children. White recently gave an interactive workshop to an audience of about a dozen parents and babies at the request of Suzanne Foley, owner of A Place to Grow on Strawberry Hill Road. Foley said White’s workshop was in celebration of the center’s 35th year. She opened centers in Arlington and Belmont as well as Concord. 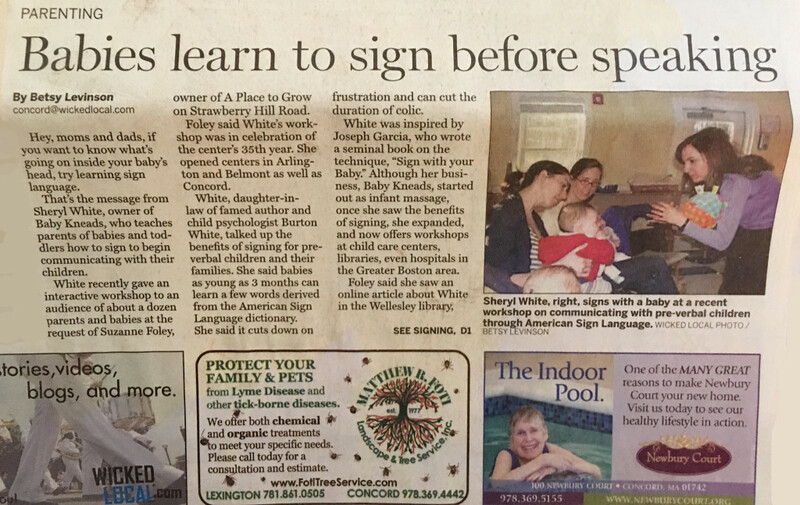 White, daughter-in-law of famed author and child psychologist Burton White, talked up the benefits of signing for pre-verbal children and their families. She said babies as young as 3 months can learn a few words derived from the American Sign Language dictionary. She said it cuts down on frustration and can cut the duration of colic. 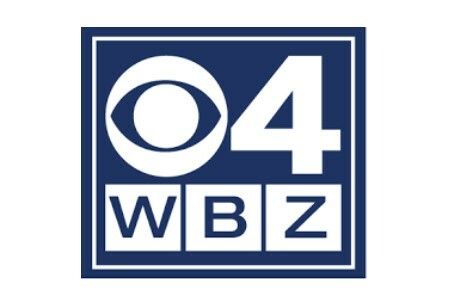 White was inspired by Joseph Garcia, who wrote a seminal book on the technique, “Sign with your Baby.” Although her business, Baby Kneads, started out as infant massage, once she saw the benefits of signing, she expanded, and now offers workshops at child care centers, libraries, even hospitals in the Greater Boston area. 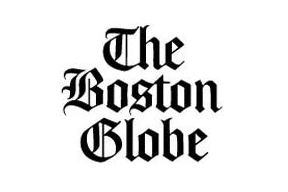 Foley said she saw an online article about White in the Wellesley library, and decided it would be a service to her parent body at A Place to Grow. She founded the childcare center in 1979, and now her husband and four daughters work there. It has been on Strawberry Hill Road for four years. White said the most frustrating time for babies is when they are 17 to 22 months and learning sign language can give them access to communication. She demonstrated her technique to babies as young as 3 months at her workshop. She shook a ball to get their attention, then stopped and signed “more?” by pressing her fingers together. She said the three first signs are normally, “milk,” “more” and “eat.” She said 6 months and older is the perfect time to start signing, although she started with her own children before then. She worried that maybe relying on sign language would lead to a delay in the spoken word. But the opposite proved true. Babies deserve high-fives for signing, she said. “Babies usually sign back to you long before you give them credit,” said White as she worked with the babies on the rug in a classroom.